this is a really nice piece there. I really like the dragon and the pose that you have draw there for em as well. ~ but for some kind of reason I am pretty sure I saw this drawing somewhere else. It's possible. It's ten years old and I used to post in more group galleries than I do now, so you may have seen it on another site. To this day this is a true classic! Aww that's so romantic and cute ant the same time. Keep up the gra term dragon artist. When my husband and I got married, we had the good fortune of finding this image. Thank you so much for allowing us to use this as the background for our wedding programs. It received many comments and questions asking where we found the image. Don't be surprised if you get a few new fans <3 It was beautiful. You're more than welcome. Congratulations to you both on your marriage! Dragons are real! How would cultures all over the world have these stories of them if they weren't real? Anyways, great picture! I have it saved on my computer. Lovely. Such tenderness. A beautiful work of art. This is so beautiful and intense. Thank you for letting me fav it! Thank you so much! I like to think of dragons as a little deeper than mindless predators. I'm glad you enjoy it. I love this picture so much! 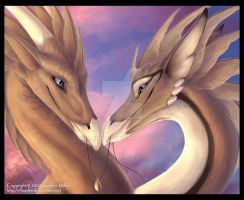 It reminds me so much of my boyfriend and I's dragonselves. Even the color of the dragons are just right. Anyway, I <3 this pic so much! very very nice one of the best dragon embrase works i've seen. very fascinating masterpiece you have I'm really stunned at the feeling you were able to put in the drawing, they almost seem to "glow".. it's absolutely beautiful and definately going into my top favourites Keep it up! The way they speak with their eyes is very magical, as it accentuates and emphasizes their closeness. I love picking out the subtle differences between the two and the overall blue tone is quite fitting. 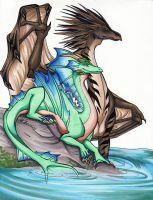 I also like how their wings are locked together in a loving embrace... seems like a natural choice for Dragon lovers. Very emotional and heartfelt image. Well done. Did I mention I love your graphite skills? The textured background looks neat as well. Oh how sweet! I really like it. You're so good at dragon snouts. I love that shape. N I C E . . . Damn this is cool! The soft blues are lovely, and what caught my eye immediately was how the background almost looks like scales... very appropriate for a dragon pic. The shading is spectacular and soft, and the embrace is indeed very romantic. I LOVE the look in their eyes, it speaks volumes. And the way the male is holding onto the female's wing like a real hand, now that's just freakin' nifty. Beautiful and sweet, an inspirational piece. Definitely earns a ! Eferri's voice from somewhere at the back: Kinda gives you ideas, right Miranda? Miranda: Dream on, horsey face. Eferri: Oh, you wound me, my love. Miranda: Is that a reguest? Awww... This is great! I love the expressions, and your style is just awesome! Their faces show so much affection for eachother. You caught the moment very well! You draw dragons so very well. No wonder you are DC. Yes, it's perfect. 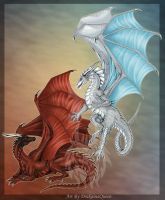 yay i hardly ever see dragons like this. aww, this is cute, their expressions are well done! Club for both Dragons and Nagas!